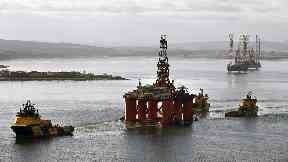 Decommissioning oil and gas platforms in the North Sea could end up costing UK taxpayers £24bn. Decommissioning oil and gas platforms in the North Sea could end up costing UK taxpayers £24bn, a new report has indicated. While this total was described as being "subject to significant uncertainty", tax breaks to help firms with the cost of this could amount to almost £13bn. The Government could also miss out on just over £11bn of revenue as a result of spending on the removal of platforms and infrastructure reducing operators' taxable profits. With some 320 oil and gas platforms in UK waters - mainly in the North Sea - the Oil and Gas Authority has said removing these at the end of their working life could cost companies between £45bn and £77bn. Rising levels of decommissioning have increased operators' spending on this to more than £1bn a year since 2014. HM Revenue and Customs has estimated tax repayments and forgone taxes associated with decommissioning will cost the public purse £24bn over the next 20 years. That total is based on a central figure of £58.3bn from the OGA estimates but the National Audit Office report states "this is subject to significant uncertainty". According to the report, "HMRC estimates that it will repay around £12.9bn to operators in taxes previously collected due to decommissioning tax reliefs". It added it estimated "the Government will forgo a further £11.1bn of tax income because of decommissioning expenditure reducing taxable profit". While the oil and gas industry has generated some £334bn in revenues since the start of the 1970s, these have been in decline. At its peak, revenues from the sector amounted to £30bn in 1984-85, making up some 11% of Government receipts. The Office for Budget Responsibility expects annual receipts from oil and gas sector to increase slightly in the next few years, rising from £1.2bn in 2017-18 to a projected £2.4bn in 2022-23. A Government spokesman said: "The UK's successful oil and gas industry employs around 280,000 people, meets almost half of our energy needs and has contributed £334bn in taxes towards our vital public services. "By providing tax relief on decommissioning we are attracting continued investment into our reserves - supporting jobs, boosting the economy and protecting our energy supply. "We are working with industry to increase the efficiency of decommissioning and minimise costs."